Blue Overalls are pretty versatile as to what shirt you can wear underneath it. For a while, I wore a Pink Mageweave Shirt, until I discovered the ultimate fishing shirt: Captain Sander’s Shirt. This shirt is one of the final rewards from a chain that starts from a map dropped by the murlocs off the coast of Westfall. The quest is attainable by both Horde and Alliance players; however, depending on your luck with farming…it might take you a while to finally loot it. The Seawolf Gloves were also a reward from a lesser known quest, also attainable by both Horde and Alliance, out in the Arathi Highlands. I feel that the mossy green color of these gloves goes great with the overall theme of the outfit…as they look like they’ve been in the ocean a couple of times ^_^ . They are also labeled with a pertinent name in the overall outfit, should anyone inspect what you’re wearing, though, you should probably enchant them with fishing to show you mean business. 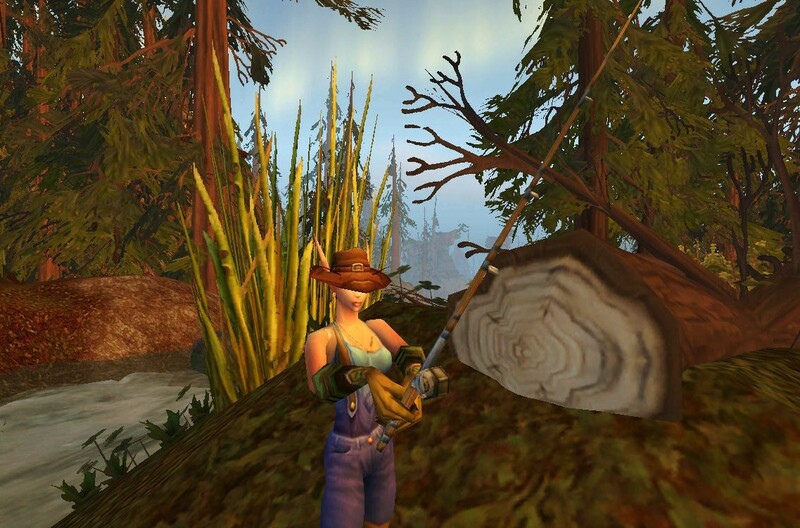 Although any hat will do just fine, the Weather Beaten Fishing Hat is a nice addition to any type of fishing outfit. Not only does it fit the part, it can also act as a lure (just in case you forgot yours in the bank). It is obtainable only through looting either the Outland and/or Northrend daily fishing quest reward bag, and it has a relatively low drop rate in both of the bags. However, trying to farm for it could yield other possible fishing treasures like a Jeweled Fishing Pole or a pet crab and a baby crocolisk! When you’re not fishing, and yet, still want to hang around in your fishing outfit…possibly telling stories of your greatest catch around a dim-lit tavern table…equip an off-hand trophy fish that will fully illustrate your bragging point. 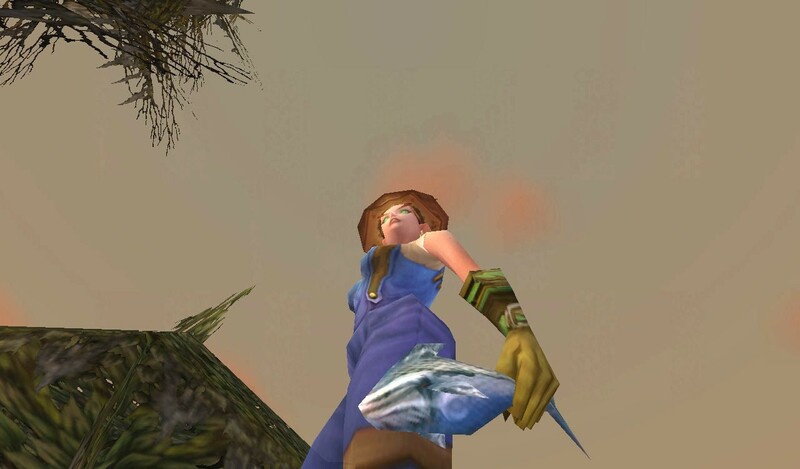 There’s also a rare catch from Northrend waters that can act as a weapon as well – the Dark Herring. And…while you’re at it…you might as well try to farm for a Sea Turtle .